This is a continuation of Mapmaking for the Non-Artist, Part 1. Been so busy that I didn't realize how much time had passed since the last installment. So here ya go with part two! Before I continue, a few of you suggested the obvious thing I should have mentioned in the first post: you can create a grid once and simply use that file as a basis for every other file you make. 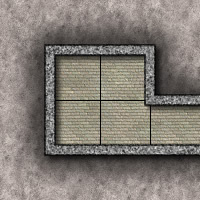 Well, I do just that so I figure I'll share mine: here are the two base files I use for all my maps, a large 50 DPI grid and a small 50 DPI grid. Hope these are useful! In this installment we are going to start to make the physical aspects of the room: walls, floor and doors. We'll deal with all the cosmetic stuff in the third installment. Before you start drawing, you need to have an idea of what your objective is. It does not have to be that specific; honestly, most of my better maps were thought of during the process. For example, I had no idea what Whiteforge was going to look like on the inside but I knew the rooms I wanted. Throughout this tutorial I thought it would be best to have a specific goal in mind. So, in honor of his return to Wizards of the Coast, our goal is to create a map for use in Monte J. Cook's very own "The World's Shortest (Yet Technically Complete) Adventure: The Orc's Pie Room". A 10' x 10' room. For argument's sake, let's make the walls stone and the floor brick. One door (currently closed) leading in to the room. Let's assume that the room is inside a dungeon, so the other side of the wall is solid rock. A table on which to put the pie and, clip art permitting, an actual pie. The Fireworks workspace. DISCLAIMER: My screen isn't this small. If we give the map a 1 square cushion on all sides that makes the map 4" x 4". Let's keep it at 50 DPI for simplicity's sake (and so the images fit in this post), so we're talking about a 200 x 200 pixel image. Using either the guidelines mentioned in Part One or by cropping one of the files listed above you should be all set with a blank 4 x 4 grid. Here we turn to Profantasy's clip art. 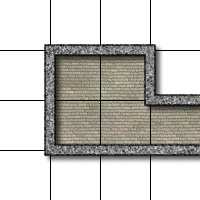 Searching through the "Terrain" folder we find a file called "Brick Grey H_LO.png", which is a 100 x 100 pixel image of a brick floor. Perfect! 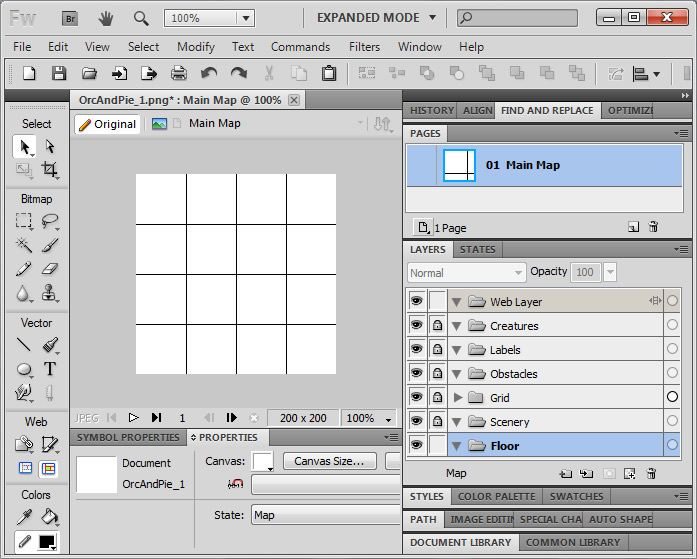 Ensure that the "Floor" layer is active and all the other layers are locked. Drag/drop the terrain on to your active document and there it is! Now depending on how you drag/drop it, it might not be in the exact position you want; the best way to adjust that is using the arrow keys and looking at the "X" and "Y" values in the left side of the "Symbol Properties" area. They should be 50 and 50, which means the tile will span the 2 x 2 grid in the center. We need to create a hallway for the door entering the room, so we take the tile we've already dropped (that's at position 50/50) and copy/paste it. Now, with that new object selected change the "X" value to 150 and make sure the "Y" value is 50; the result would be that the tile moves to the right side adjacent to the original tile. But the tile's too big! 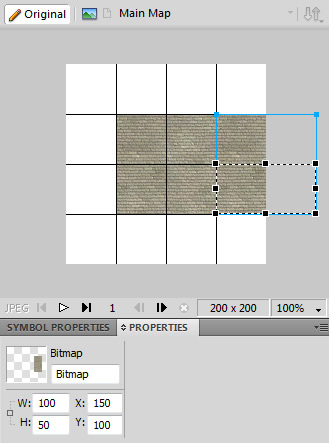 Right-click on the tile and choose "Edit" -> "Crop Selected Bitmap". A black marquee will appear around it. Now you can either move the top edge down 50 pixels by hand or do it the easy way: manually change the numbers in the properties (see image) and hit Enter. Done! You now have a 5' wide hallway in the Southeast corner heading East. Over time you may get the hang of doing this cropping with the mouse (once you get enough pieces in a map, Fireworks automatically snaps to existing X/Y boundaries of other objects), but in the beginning (personally, pretty much all the time) I manually enter the values for positioning and cropping. The math's not all that difficult; it's always multiples of the DPI. Also do remember one thing: now that you have this one piece cropped and sized, you can copy/paste it as many times as needed to extend the hallway. First, remember to lock the "Floor" and unlock the "Obstacles" layer. Now comes fun part #1: making a complex path for the walls. As in real life, the walls are a collection of rectangles that are simply welded together, or "joined" if you want to use Fireworks terminology. For a 50 DPI image, I go with 10 pixels as the wall width; that equates to about a foot, so it works out. For a 200 DPI image that would be four times the size, or 40 pixels. But, since the walls are supposed to be right on the grid lines, they take up space equal to the grid line +/- half the wall thickness. So now we create a bunch of rectangles. The way I tend to do it is to just draw them freehand in a reasonably close position to where they're supposed to go, then manually adjust the values in the Symbol Properties. In our example, we need a total of five rectangles. The rectangle that makes the Northernmost wall will be 110 pixels wide (100 pixels for the base size, plus half the wall thickness at the ends), 10 pixels high and positioned at 45/45 (offset by half the width). The image on the right shows the rectangles with a slight transparency just so you can see their position relative to the floor below. 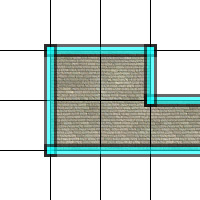 NOTE: For any wall that extends off the map, ensure that you make the rectangle larger so that it does go off the map. If you leave it at the map's edge, when you give the rectangle a border it will be visible. Once you draw all the rectangles, select them all and choose the menu option "Modify" -> "Combine Path" -> "Union". This will create one contiguous polygon. Section 2 (from left): Fireworks comes with a collection of fill patterns, one of which looks pretty good for walls. While the polygon is selected, choose "Pattern" -> "Moon" for the fill category. It will apply it to the texture, but in its native format is rather big for our taste, so with the mouse grab one of the black squares that should now be visible and - while holding the Shift key - drag it so that the "L" becomes smaller. Also, in order to make it appear less repetitive, you can choose to rotate the pattern by clicking and dragging the line between the "L"'s endpoint and the center dot. Section 3: As for the stroke (the border), I always choose Black, 2-3 pixel width, "Basic" -> "Soft Rounded" as the stroke category and 100% as the edge softness. If you want to give it a slightly rough look, you can set the texture to "Grain" and the amount of texture to 50%. Section 4: Click on the "+" sign and choose "Shadow and Glow" -> "Drop Shadow". The default values are fine at 50 DPI, but you can mess with them at your discretion. Now fun part #2... creating the solid stone that fills the space on the other side of the wall. What we want to create is a polygon that encompasses that area, using a similar style as above. There are a variety of ways this could be done, depending on the complexity of the map area that the players could actually navigate. One method is to simply create a bunch of rectangles and join them together (which is the method I will use below), while another is to create one massive rectangle and "punch" pieces out of it. Before we continue, ensure you are in the "Obstacles" layer and turn all the other layers off. Because of the effect we intend to use later we want the rectangles to be larger than the map's physical canvas, so I'm using our DPI (50) as a cushion and start drawing rectangles; if you don't do this, the inner glow we will apply later will be visible along the edge of the map. I draw the rectangles fairly roughly and close to their positions at first, then edit the numeric values in the Symbol Properties like I did above to make sure they line up perfectly. Then select all the rectangles you created and choose "Modify" ->"Combine Paths" -> "Union". This will join all the rectangles in to one contiguous object (see image to right). There is the possibility that some of the points will appear redundant, such as the ones along the edges, but that may not matter. You can usually leave them there at first, but as the map gets larger you may want to selectively delete some of these points (using the Subselection tool) in order to decrease the complexity of the polygon. At this point ensure that the object is at the bottom of the layer, which you can ensure by selecting the object and choosing "Modify" -> "Arrange" -> "Send to Back". Now it's time to texture it... I use the either "mountain light_hi.jpg" or "mountain light_lo.jpg" from the ProFantasy collection, which you can choose by selecting the new polygon and going to "Pattern" -> "Other..." in the Fill options and choosing your texture through the file browser. In order to make the texture repetition less obvious, I like to rotate the texture slightly after it is applied (see image to the right). Finally, it's time to give it a little bit of effect and show why you created the polygon larger than the map's area in the first place. In the "Filters" section on the bottom, choose "Shadow and Glow" -> "Inner Glow". For the "Width" and "Softness" values, I've found that setting them both to half the DPI (25, in our case) works fairly well. The result is what you see: an outer area that looks like solid stone. And there ya go... The orc has his room! If you wish to see the Fireworks PNG with all the components, you can download it HERE. Over time you'll begin to realize that this style of mapmaking feels more like mathematics and geometry than actual artistry. I find myself calculating coordinates and dimensions with a calculator and manually entering the values in to the Symbpl Properties more often than not; I hardly ever freehand draw anything, unless I want it to be badly drawn (like natural cave walls). In the next installment we're going to put a little more decoration: doors, furniture and an actual orc. As a long-time DM, I found this to be a great resource for making maps.